After the initial speakers in the Lenovo smart range were announced at the beginning of this year during CES 2017, Lenovo has this week announced the imminent launch of its latest smart speaker in the form of the Lenovo Home Assistant. 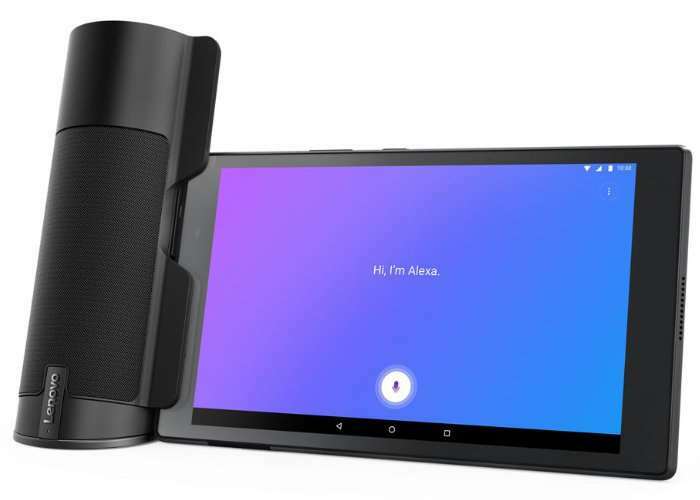 Which can be combined with an android tablet to provide connectivity to Amazon’s Alexa voice service. The smart speaker support attachment to the Lenovo Tab 48, Tab 4 8 Plus, Tab 4 10 or Tab 4 10 Plus. The Lenovo Tab 4 series just got a whole lot more versatile, with the introduction of the Lenovo Home Assistant Pack. The Home Assistant Pack boosts the sound of your Lenovo Tab 4 with two powerful three-watt speakers that can fill up a large room. Far-field detection recognizes your voice from up to three meters from any direction through two built-in mics. And at 300 grams, it’s as portable as paperback, so you can move it from room to room. Just attach your Lenovo Tab 4 to the docking station, and your screen automatically switches to the home assistant interface. And you’re ready to go. For more details in full specifications jump over to the official Lenovo website by following the link below.